Use this crustless quiche recipe to make all of your favorite quiches. The result will be the same great taste without the fuss or calories of the crust, which is truly not missed. What a great dish for people on low carbohydrate diets and there is even a gluten free version. Less fuss - A crustless quiche recipe is literally one of the easiest and quickest dishes you can make. Fewer calories - One pate brisée crust adds more than a thousand calories. So if you are trying to lighten up, this is a great option. Of course keep in mind that quiche will still be pretty rich even without the crust. Low carb - A lot of people these days are convinced that eating fewer carbohydrates is an important part of a healthier life. The crustless quiche recipe has only six grams of carbohydrate per slice (1/6 of the recipe below) - amking it a low carb winner. 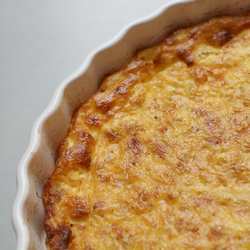 Great taste - You may even find that the texture of the quiche is improved by the addition of the small amount of flour to the filling ingredients. Looks great too - Because there is no crust to slip down the side, this quiche always ends up with a nice edge. Crustless shows off your pretty tart pans to their best advantage. As with other quiche recipes, this can be served either hot or cold, and makes a great appetizer as well as a starting course or main dish. If you wish to reheat it, put it in a preheated oven for about five minutes. Or if you are less picky (quiche may get a bit rubbery), simply place it in the microwave for about half a minute per slice. A nice way to serve crustless quiche as an appetizer is to slice it into cubes and put it on toothpicks. As long as you have sliced the filling ingredients small enough, the cubes hold up well. Whisk the eggs together with the flour, just until the eggs are blended and there are not too many clumps of flour. Whisk in the salt, pepper and nutmeg. Finally, stir in the cheese and ham. Pour into the prepared quiche pan, stirring the ingredients together as you pour (this helps to insure that the ham and cheese are evenly distributed). Bake at 400°F (200°C) for 30 minutes. Variations: Use whatever you wish in substitute for the the cheese and ham. Most any quiche can be made into a crustless version. Just follow the order of mixing ingredients given in the recipe here, and don't forget to include the flour. Gluten Free: Substitute an equal amount of cornstarch for the 2 tablespoons of flour.